Most of a modern vehicle’s systems are controlled by electrical components, and occasionally these components can fail. 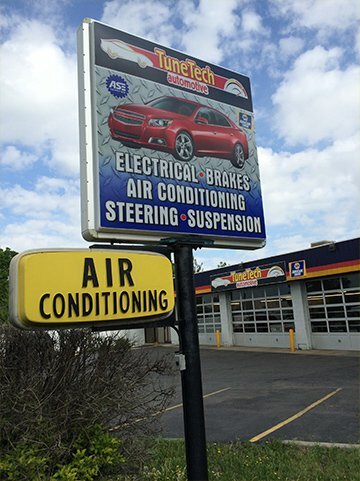 Part of what we do at Tune Tech Automotive is diagnose and repair automotive electrical components. Stay Safe - Maintain Your Brakes! Brakes are the most important safety device on your car. If you’ve ever partially lost your brakes in the past, you’ll agree that it’s not something you want to experience again. Engine oil is what lubricates a car’s engine, allowing it to run smoothly and last longer. Car owners must maintain a car’s engine by changing the oil and using the oil appropriate for their car’s make and model. Every car comes with a “check oil” light and an oil filler under the hood. Everyone dreads the thought of a major car repair, but the bright side is that many major vehicle issues can be avoided by following the vehicle maintenance schedule recommended by your car’s manufacturer. The suspension is a major system found in your vehicle. It plays a vital role in stopping, steering and stability. All of the components of the suspension system absorbs all the impact and helps you maintain control when you hit bumps, obstacles or potholes, ensuring the safety and comfort of passengers. Following scheduled maintenance intervals and getting regular tune ups on your vehicle is a great way to keep it running smoothly, safely and efficiently. A properly tuned vehicle can have increased gas mileage, better performance, and improved emissions (better for the environment). Tune Tech Automotive has been providing quality car care in Aurora, CO since 1995. We are a family owned mechanic shop delivering honest and professional automotive repair and auto maintenance services to the people of Aurora and surrounding areas. The quality ASE (automotive service excellence) certified technicians at Tune Tech Automotive employ today’s latest automotive technology and are equipped to handle all major and minor repairs on foreign and domestic vehicles. We specialize in automotive electrical repair, scheduled car maintenance, tune-ups, oil changes, brake jobs, and suspension. Tune Tech Automotive is a certified Napa Auto Care Center, we are able to provide the benefits of an established national entity while maintaining the personal touch of a family owned business. We understand that your vehicle is a major investment, and that is why we care for each customer’s vehicle as if it were our own. Come by and visit our clean and professional shop in Aurora, CO today! We are pleased to offer a 10% discount to military personnel. Thank you for your service. "Honest auto shop. I will go out of my way to have these guys service my car. As a single female I always feel taken advantage of. Not here!"